Montel Fagan-Jordan from Greig City Academy in Haringey London has won the prestigious YJA Young Sailor of the Year Award. Montel was team captain and main helmsman onboard 45ft German Frers designed Scaramouche for the Rolex Fastnet Race 2017. 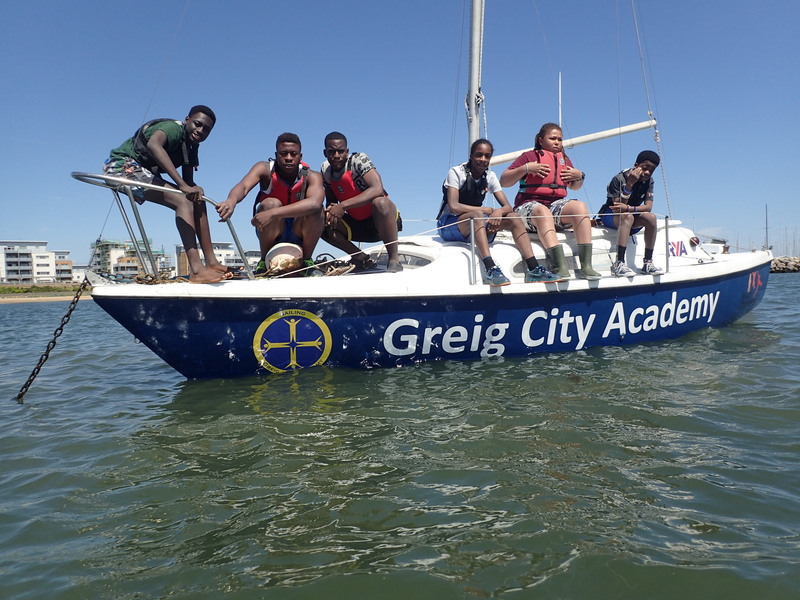 Leading a crew of eight students, under the watchful eye of two Yachtmasters and his two teachers from Greig City Academy Mr Jon Holt and Mr Paul Leftord. In completing the race, it is believed they are the first comprehensive state school to do so and the only school to compete in 2017. They won the respect of their competitors during the qualification process and throughout the race. At the prizegiving, they were awarded the Musto Media Prize for how they told their story along the way. “Thank you to everyone who has made this possible. 5 years ago, I didn’t really know what sailing was, so you can imagine it is rather overwhelming to be stood here next to some of sailing’s greats.” Commented Montel during the ceremony. This was all made possible by so many people. Pioneer Underwriters, who came on board as the projects title sponsor in 2017, to the companies who provided equipment, the trusts who provided financial support, and all the sailors who have given their knowledge freely. Previous winners of this award include Annabel Vose who in 2017 was victorious in the Red Bull Youth America’s Cup in Bermuda as part of Land Rover BAR Academy, Sir Ben Ainslie the most decorated Olympic Sailor in history, and Hannah Mills MBE silver medallist in the 470 at London 2012, taking gold in the same class at Rio 2016. Paul Sutton, principal of Greig City Academy, is very open to ideas, and very much has the can-do attitude, rather than worrying what if it goes wrong, he focuses on the what if it goes right. “This has gone right,” commented Jon Holt. In addition to the Montel’s achievements on Scaramouche, in January 2017, along with Shabazz Patterson and Camilio Orobio they fine-tuned their sailing skills in the Etchells One Design Class. This was made possible by David Franks fleet captain in Cowes, with coaching from Matt Reid, who invited the crew along for some initial training weekends and to take part in assessment weekend with the opportunity to ‘win’ an Etchells for the season. David realised that although this crew were very competent sailors they had done very little boat on boat racing. In the Etchells in 2017, they won the assessment weekend gaining access to an Etchells for the season with Montel helming, Shabazz on sail trim / mid-bow, and Camilio using his strength and power on the bow. They went to be the first British youth crew at the Gertrude Cup in Cowes, they also flew out to Miami to compete against some of the best sailors in the world at the Louis Piana Cup. They finished 12 overall out of a fleet of 44 boats, finishing an impressive sixth in one race. Montel was also invited to helm Lutine during Lendy Cowes Week with the project’s title sponsor Pioneer Underwriters where they were victorious in the races in which Montel joined them. We are delighted with the way the project has evolved in 2017, and 2018 is are looking forward to the launch of our girl’s programme and continuing the momentum with the boys. Congratulations to Alex Thomson who was presented with the YJA Yachtsman of the year. Jon Holt and Montel are available for interviews, contact lou@boxpr.co.uk for details.